There are plenty of different methods that can be used to cook food these days and one of the most popular is pressure cooking. A pressure cooker offers many benefits including conserving energy, faster cooking times and cooler kitchens. There are a lot of models on the market right now, so unless you are specific in what you want, choosing the right model can actually be quite a difficult task. In order to take some of the work out of searching for the right model, we have decided to test and review some of the best pressure cookers on the market right now. Please read on below to see our verdicts on the models that we chose for our top three. Very large 6 litre capacity makes it perfect for family cooking. 8 different pressure levels for optimum results. It is one of the more expensive options. 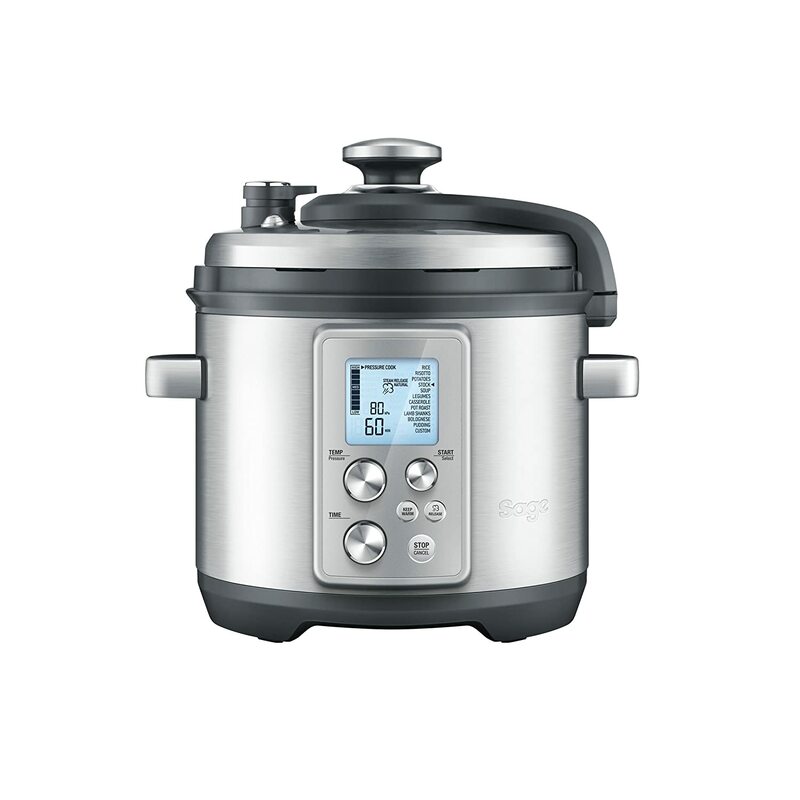 Number one on our list of the best pressure cookers goes to this model from the Sage range by Heston Blumenthal. The main thing that drew us to this pressure cooker was the design, but after thoroughly testing the cooker, we were very impressed by the results that it has to offer. First of all, we’d like to talk about the design. We originally thought that it seemed perhaps a little too futuristic, but after closer inspection we actually liked this aspect. We were able to test out all of the different programs on offer without running into any difficulties at all. One of the things that we really liked about this pressure cooker is that it allows you to use several different cooking methods from slow cooking to pressure cooking and everything in between. We noticed a huge difference in the amount of heat in the kitchen with this pressure cooker. We were able to use it for long periods of time without having to deal with any extra heat in the kitchen. Overall, we were really impressed with this one and would recommend it to anyone who would like to start using a pressure cooker at home. Plenty of built in programs to choose from. Can cook seven different ways. LCD display could perhaps be a little bigger. Figuring out the different settings can be confusing. 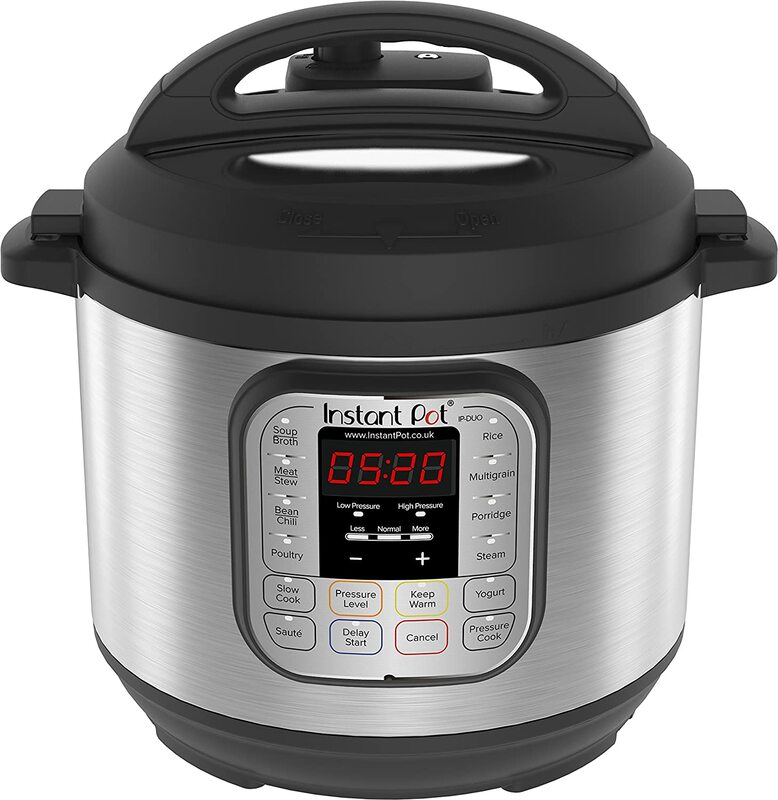 Next on our list of the best pressure cookers is this one from Instant Pot. This is a well known brand in kitchen appliances, so we knew that we were going to be impressed with this one. What drew us initially to the Instant Pot Duo V2 Pressure cooker is the design. It looks very sleek and highly sophisticated. It has an LCD display with touch sensitive buttons to allow you to select your chosen program and settings. We did have a couple of issues here. First of all, there is the fact that the LCD screen itself could perhaps benefit from being a little larger. We felt that those with poor eyesight might struggle with it. Another issue we had is that we found it quite difficult to navigate the settings and programs. There is an instruction manual with the pressure cooker, but we still had to do a little research online to figure it all out. Aside from this, there are plenty of plus points. First of all, there are 14 different programs to choose from. We tested all of them and were really impressed with the results. As well as this, there is a 24 hour timer which allows you to time your meals perfectly. Although there are a couple of issues that we had with this pressure cooker, we would still recommend it, especially for those who want to enjoy family cooking. Perfect for cooking for one to two people. Still has adjustable heat settings. It is a very basic pressure cooker. There are no built in programs. There is only one heat setting. Finally on our list of the best pressure cookers is this model from Tower Pro. We decided that we wanted to test out a basic model as well as the others and went for the Tower Pro One Touch Pressure Cooker. What initially attracted us with this one is the design. Although it is very basic, it certainly looks and feels very durable. Using this pressure cooker was no trouble at all. There are no complicated menus to navigate and it is very effective. However, there are a couple of drawbacks that are worth mentioning. First of all, as this is a basic pressure cooker, you don’t get the advantage of built in programs. As well as this, there is only one heat setting that you can use. Cooking options are quite limited with this one, which might not appeal to some people. 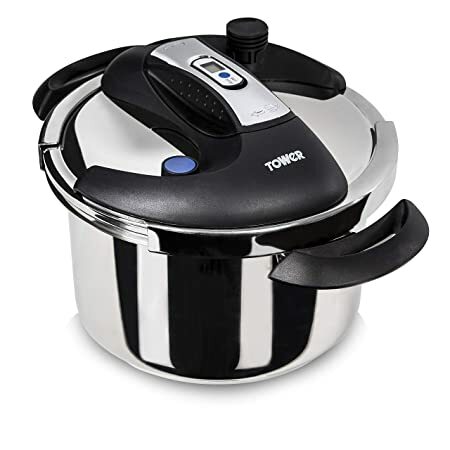 However, for 1-2 people who are looking for a budget pressure cooker that works well, this model from Tower Pro is a great choice. As you can see, there are pressure cookers available to suit everyone so take your pick from the three above and choose whichever one suits you.